There are basically two types of fishing reel, there are the spinning reels and on the other end there are the conventional reels. You will have to decide which category of reel will best meet your needs. If you are a new angler, you'll probably find a spinning reel easier to cast and use compared to conventional reel. When choosing a spinning reel there are a few terms and attributes you should know, that will allow you to make better decisions and allow you to communicate better when purchasing your reels. Size - The size of the reel generally give the user an estimate of the amount of line that can be spooled into the reel. On the spool there are usually some marking to indicate the line capacity. eg 8/250 10/210 12/180 this indicated that the spool can contain 250 meters of general 8lb monofilament line or 180 meters of 12lb monofilament, this work on the fact that 12lb line is thicker or larger in diameter compare to the 8lb line. With the introduction of and widespread use of braided line nowadays, you will have to do some additional calculation if you're going with braid. The way to do this is to take the estimated diameter of the given mono line (eg. 8lb) and divide it with the diameter of your braided line. Once the get your result (ie. the multiples) you just need to multiply the given length (eg. 250) with your result to know the length of braid you can store on the spool. Retrieval Ratio - The rate which the spool rotates in relation to one rotation of the handle. The bigger the ratio the the faster the spool rotates. Eg. 5.1 : 1 is slower then then 6.3 : 1. Since line is retrieve as the spool rotates, it also means that a spool with a higher retrieval ratio is able to retrieve line faster, or all else being equal able to retrieve a lure faster then a lower ratio spool. While the ability to do a fast retrieval of a line would probably interest a lurer, a reel with a low ratio provide greater hauling power essential for someone fishing with heavy terminal tackle. IMHO if you're the latter kind of angler, a conventional reel would be a better fit, as it's stronger in the "power" division. Max Drag - The drag of your reel works like a braking system preventing the line from being pull out of your reel too fast. The higher the drag is set, the harder it is for the fish to pull the line out of your reel. The drag is usually set by tightening the knob at the front (front drag model) or the rear(rear drag models) of the spool. There is also type of spinning reel call a baitfeeder reel, that provides you the ability to set two different drag tension. This reel is usually used for live baiting where you want to fish to take off with the live bait initially at lower tension but allow the angler to switch to a stronger drag to fight the fish. According to standard practices, the drag of reel is usually set to 1/3 the poundage of the line spooled. Refer to this page on how to set the drag on a spinning reel. The max drag basically indicate the highest drag setting the reel can sustain. The higher this rating is, the stronger is the reel. Ball Bearings - All the spinning reel available in the market, will either have ball bearings or bushings or both. The ball bearing and bushing are placed within the reel to provide smoothness, support and stability at the interfaces between the parts of the reel that are revolving or rotating, against the frame holding it in position. In term of smoothness and durability , a well maintained stainless steel ball bearing will always out perform plastic bushing, but to make economical sense and to manage cost, most manufacturer uses both in their spinning reels. Some spinning reels also feature a roller bearing within the line roller, this help to reduce friction when retrieving the line and also prevent the line from twisting. Generally speaking, the more ball bearings a reel has, the more smoothly it will perform. But there is a catch, ball bearing are usually made of stainless steel but when it comes into contact with sea water, it will still rust. Rust degrade the ball bearing performance and in most case degrade it so much that it worst than just having a plastic bushing in place. In some cases the rust can get so bad that the ball bearing get jammed up and refuse to turn. So, there is no need to over emphasize on bearings, remember plastic don't rust so you'll never have this problem. For spinning reel you probably want to pick one with minimum 3 ball bearings if possible. Also note that for most brands when they indicate 3 + 1 or 5/1 the "1" is likely not referring to the line roller bearing. Spools - The more common of the spinning reel we see in most shops locally of the skirted spool version. The "skirt" keeps the line contained with the spool and together with the bail ensure that line is laid evening and neatly into the spool, this assist to prevent entanglement or "birds-nest" during casting. Such spools also comes in various varieties other then the standard design, there are the shallower or deeper design and elongated "long cast" spool design. Some reels are sold with spare spool to allow you to load different poundage line to each and having the option to switch spool while fishing. An issue common with spool is corrosion and pitting. This is cause by coming in contact with water, especially seawater therefore the material used to make the spool is important, most spools are made of some form of Aluminum nowadays. Corrosion and pitting can degrade the casting performance of a spool especially when it near the lip area, the roughness will also cause abrasion on the line and weaken it. Some manufacturer do manufacture spool with special coating that resist corrosion better, but it also the angler responsibility to make sure the reel is washed clean after every use to prolong it's effective life span. 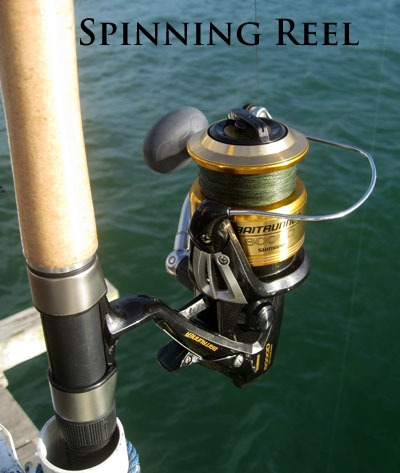 Above are the more important attributes you need to know when selecting a spinning reel. Some features such as drag and bearing can be change or added to improve performance, where as other features are of a fix nature. Selecting a reel that suit you doesn't end here, you should visit a better stocked shop and asked to touch and feel the reels that interest you. From that you can get a feel of the weight, texture of the material, balance, etc, etc. which will contribute to your decision of your next reel.